The mini-Naadam, an elaborate and colorful festival of ‘the three games of men’, horse riding, archery and wrestling. The many skills on display at Terelj National Park provide insight into the local tradition, ceremony and culture of these sublime lands. Lake Baikal by train. A day dedicated entirely to enjoying the blissful Lake Baikal, the oldest and deepest freshwater lake in the world. Unbelievable vistas of outstanding natural beauty. A panoramic train route that runs directly alongside the lake, with opportunities to swim, picnic and much more. A truly rejuvenating day. Get up close to authentic Siberian villages, country lanes and wooden houses. Straight out of a fairy-tale, as if you’re in a picture book. Dramatic skies and mountain tops add to the sensation of witnessing a legend come to life. It’s the first day of what will be an unforgettable journey. You arrive in Moscow, one of the most vivid, dynamic and historic cities on Earth. After a welcome dinner, you experience the richness and color of Moscow at night on a tour that includes the dreamlike Red Square and the city’s palatial subway stations. After your urban adventure, you return to your comfortable and centrally located hotel. You wake up to a beautiful morning in Moscow. Today you marvel at the magnificent architecture of the city, including the grounds of the Kremlin, the stunning St. Basil’s Cathedral and the Novodevichy Convent. You visit the beautifully reconstructed Cathedral of Christ the Savior and pass by the notorious former KGB headquarters, the imposing Soviet architecture of the Russian White House and Lomonosov University, before departing from this bold and charismatic city. In the evening, you board your private train, the Tsar’s Gold. Today is dedicated to picturesque and historic Kazan, the capital city of Russia’s Republic of Tatarstan, on the banks of the Volga. You tour the city’s traditional Russian architecture and listen to fascinating stories about the Kazan Kremlin. You learn about the historically volatile relationship between the Tatars, Cossacks and Russians who inhabit the area. Yekaterinburg is known as the capital of the ancient Ural Mountain range. Its position on the Asia–Europe border gives the city a fascinating and unique character. You visit the carefully preserved city center and fairy tale-like Church of All Saints, a memorial at the site where the Romanovs, Russia’s last Tsarist dynasty, were assassinated by revolutionaries. That afternoon, your train crosses the border from Europe into Asia. In Russia, the word bread is associated with hospitality, and salt with friendship. In the city of Novosibirsk, you’re welcomed warmly with bread and salt in this tradition. You arrive in Siberia’s biggest city at noon and take a tour that includes the majestic Ob River. Today you enjoy stunning views of Siberia from the comfort of your private train. The sunlight breaks through the mist surrounding forest-covered mountains. Rivers roll along their jagged, rocky banks in rhythm with the tracks. Entertaining talks on local history and culture double as get-togethers with your fellow travelers, complete with Russian canapés. You’ve arrived in popular and historic Irkutsk. You leave your luggage in your private train compartment, leaving your hands free to discover the city. You see the city’s colorful market, the theater and the City History Museum of Irkutsk before enjoying a relaxed dinner in the evening. Today is dedicated to enjoying gorgeous Lake Baikal, the oldest and deepest freshwater lake in the world. Its clear, deep, aquamarine waters glitter in the sun. The mountains are mirrored in the lake’s glass-like surface. You enjoy a boat ride to Port Baikal and have many opportunities to take amazing photos on the Circum-Baikal Railroad. Relax, take a dip and explore the scenery or picturesque villages. On warm nights, dinner is served as a picnic on the lake’s pristine shores, the perfect ending to a memorable day. Today, your private train journeys along the green and picturesque valley of the Selenga River. Soon you arrive in Ulan-Ude, the bustling and friendly capital of the Republic of Buryatia, Russia, where you enjoy a guided tour through the city. This morning the vibrant Mongolian capital, Ulan Bator, awaits. Today you leave your luggage in your train compartment so that you can focus on enjoying the city’s unique attractions, including the meticulously restored Gandan Monastery and the gorgeous Choijin Lama Temple. In the evening, you enjoy captivating performances of traditional Mongolian music (bookable in advance). Today you experience the stunning natural beauty of the Mongolian Alps. A picnic outside a Mongolian yurt in the great outdoors is the perfect way to enjoy lunch. You have the unique opportunity to try local specialties: khorkhog, a traditional Mongolian barbecued lamb dish cooked in a metal jug; and airag, a drink made from fermented mare’s milk, known as the beer of the Mongols. In the afternoon, you marvel at an exhibition of traditional Mongolian skills, including horseback riding, wrestling and archery in a mini version of the national games, Nadaam. That evening, your private train travels onward to the Chinese border. Around noon you arrive at the Mongolia–China border, where you disembark the Tsar’s Gold and switch to a Chinese private train. Here you discover Erlian, an authentic border town where you browse its famous market and pick up unique souvenirs of your once-in-a-lifetime journey. Later, you relax and enjoy dramatic views of the stunning Gobi Desert from the windows your Chinese private train. Once you arrive in Beijing, you check in at your first-class hotel, after which you have the afternoon and evening free to explore the thriving capital of China, one of the world’s oldest and most fascinating countries. Today your friendly, knowledgeable guides show you the stunning sights of beautiful Beijing—from the Temple of Heaven, a medieval architectural masterpiece, to the infamous Tiananmen Square. In the afternoon, you explore the world-renowned Forbidden City—a UNESCO World Heritage Site and the former Chinese imperial palace, now home to the Palace Museum. The construction of its glorious halls and temples required over a million workers and was inaccessible to the public for centuries. Today you experience the legendary beauty and awe of the Great Wall of China, one of the world’s largest ancient structures. You also stop at the Ming Tombs imperial necropolis and see the Sacred Way , a 4-mile road leading to the burial sites of 13 Ming emperors. In the evening, you share conversations with fellow travelers over a feast of Peking Duck at one of China’s impressive themed restaurants. 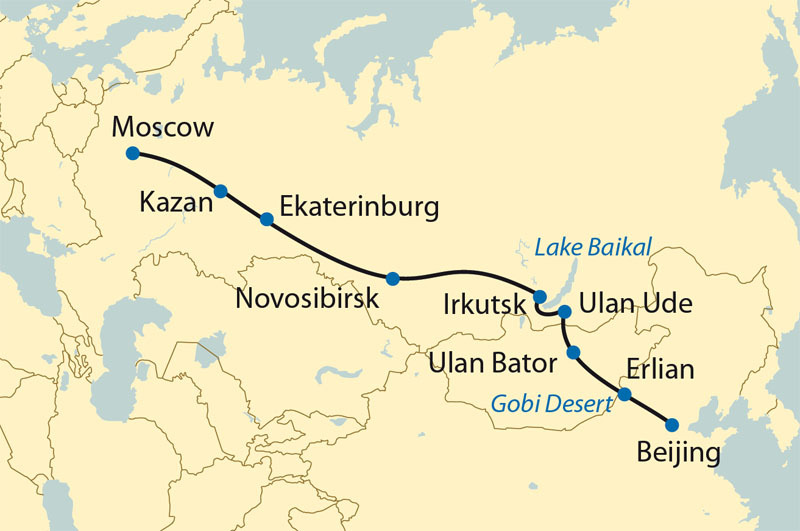 The Trans-Siberian Railroad is simply legendary. One of the greatest travel adventures in the world. Explore Russia, Mongolia and China through our private train tours and enjoy travel that is captivating, comfortable, straightforward and secure. Moscow to Beijing by train. Stunning scenery, splendid and opulent lands. A once-in-a-lifetime experience.